Anastasia (a vampire who appeared in a previous Kitty book) is in San Francisco searching for a magical artifact called the Dragon’s Pearl. Vampire Roman (the series big bad) is also looking for the Pearl. Roman has a small army of underlings bound to him by magic. Anastasia needs some muscle, which is where Kitty, her werewolf husband Ben, and their magical pal Cormac come in. Normally, the Dragon’s Pearl falls into the category “useful but not world-shaking.” It’s a cornucopia of sorts: put an item in, get many identical items out. Roman believe he can use it to duplicate the magical tokens he uses to bind his minions, side-stepping an otherwise time-consuming process. If he is right and if he can get his hands on the Pearl, he will be able to create a vast army overnight. The team’s first foray to locate the Pearl leads them into an otherworldly dimension, where Kitty’s crew discovers that Roman’s minion has found their way to the repository too and … that the Pearl is missing. There is a third party looking for the Pearl and that third Party has found it. 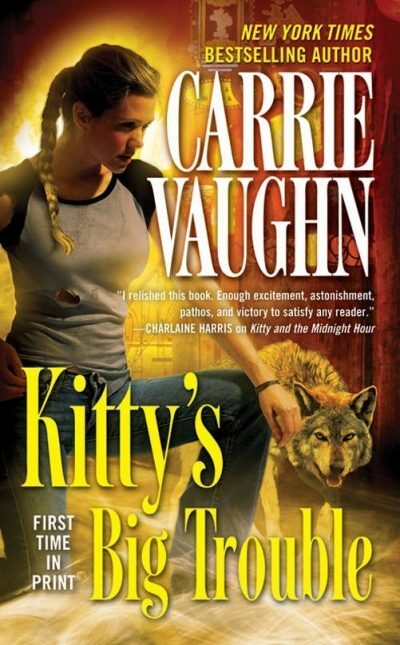 Kitty has met vampires, werewolves, were-tigers, magicians, and psychics. Now she will get to meet gods. Most urban fantasies do not feature consistent, complete settings. One learns not to ask questions. Or at least most readers do. This intrepid reviewer wonders what other gods might be wandering around the Earth and why the gods and demigods don’t seem to be able to do anything useful about Roman, the big bad. I suppose the answer would be that people like Anastasia and Kitty are the god’s chosen tools. This was a re-read; I read it for SFBC, years ago. This was the last Kitty book they sent me. This was not the last Kitty book published (there are five more) and I kept working for SFBC for a few more years. I don’t know why the flow of Vaughn books stopped. Whimsical are the ways of publishers. What this means is that here on out, I will be reading books new to me. I wonder what will happen! At this point in the series it seems as if Kitty has fully embraced the whole unsanctioned use of lethal violence ethic that supernatural beings all appear to follow. Oh, well. I really liked Kitty as a modern person with modern values, but I guess that wasn’t the direction the author wanted to go. This is a bit of an odd entry. Kitty gets handed the job of opposing Roman by the end of the book, but she was already doing that. It’s almost as though she is a significant supporting character in someone else’s story. Which makes me wonder if it is coincidental that the title of this book so echoes the film Big Trouble in Little China, whose protagonist Jack Burton was essentially a sidekick to a more effective character. Burton was cheerfully oblivious to his actual status, whereas Kitty has a more realistic view of where she fits in the supernatural pecking order. Now I really want to know where the series is going. Kitty’s Big Trouble is available here (Amazon) and here (Chapters-Indigo).